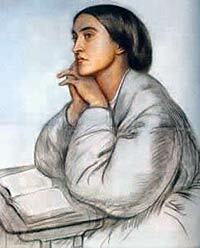 O God, whom heaven cannot hold, who didst inspire Christina Rossetti to express the mystery of the Incarnation through her poems: Help us to follow her example in giving our hearts to Christ, who is love; and who is alive and reignest with thee and the Holy Spirit, one God, in glory everlasting. Amen. Christina Georgina Rossetti (5 December 1830 – 29 December 1894) was an English poet who wrote a variety of romantic, devotional, and children's poems. She is best known for her long poem Goblin Market, her love poem "Remember", and for the words of what became the popular Christmas carol "In the Bleak Midwinter". Rossetti was born in London and educated at home by her mother. Her father, Gabriele Rossetti, was an Italian poet and a political asylum seeker from Naples; their mother, Frances Polidori, was the sister of Lord Byron's friend and physician, John William Polidori, author of The Vampyre. When she was 14, Rossetti suffered a nervous breakdown, which was followed by bouts of depression and related illness. During this period she, her mother, and her sister became seriously interested in the Anglo-Catholic movement of the Church of England. This religious devotion played a major role in Rossetti's personal life. She was a volunteer worker from 1859 to 1870 at the St. Mary Magdalene "house of charity" in Highgate, a refuge for former prostitutes. Rossetti began writing at age 7, but she was 18 when her first published poem appeared in the Athenaeum magazine. However her most famous collection, Goblin Market and Other Poems, appeared in 1862, when she was 31. The collection garnered much critical praise and, according to Jan Marsh, "Elizabeth Barrett Browning's death" (in 1861) "led to Rossetti being hailed as her natural successor as 'female laureate'." Her Christmas poem "In the Bleak Midwinter" (Hymnal 1982 #112) became widely known after her death when set as a Christmas carol first by Gustav Holst, and then by Harold Darke: in this setting it was judged in 1998 the best carol in a poll of some of the world's leading choirmasters and choral experts. Her poem "Love Came Down at Christmas" (1885; Hymnal 1982 #84) has also been widely arranged as a carol. Rossetti continued to write and publish for the rest of her life although she focused primarily on devotional writing and children's poetry. In the later decades of her life, she suffered from Graves Disease. In 1893 she developed cancer, and died the following year 29 December 1894.